The advent of the third-party appraisal of a coin's physical condition (which is the basis of its grade), backed by the PCGS Guarantee and our network of reputable Authorized Dealers, provides a dependable form of protection for rare coin collectors. 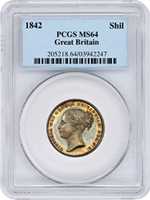 Our respected grading standard has enabled PCGS-graded coins to realize record prices in the marketplace. 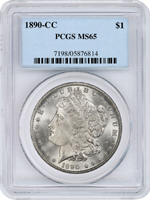 When experienced collectors buy coins, they often buy them certified by the name they trust – PCGS. In addition to standardized grading, PCGS offers a guarantee of grading accuracy and authenticity for each coin we encapsulate. With decades of combined experience, PCGS graders are selected from an elite group of world-class numismatic experts – some of the most respected and admired in the rare coin industry. As we receive submissions, each coin goes through a step-by-step grading process which ensures the utmost care and consideration of your prized numismatic investment. 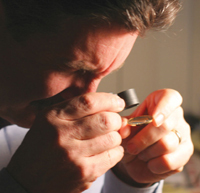 Our experts handle each coin as if it were part of their own collection. Each expert works independently in a controlled environment that provides optimum conditions for studying the characteristics and physical condition of each coin. A series of graders enters independent determinations in a computer database until a consensus is reached and the final grade is assigned. To augment their high level of experience, our graders can refer to comprehensive grading sets of U.S. and international coins in order to adhere to PCGS grading standards. In addition to our expert grading services, PCGS offers several resources for coin enthusiasts to keep up-to-date with current events, prices and information. The PCGS online Price Guide, updated daily, is the most comprehensive list of prices for PCGS-graded coins. Receiving over 100,000 visits each day, this guide is used by collectors as a reference when buying and selling coins. Other resources include the all-new PCGS CoinFacts, a comprehensive online encyclopedia that will soon offer all the information for every U.S. coin; PCGS Population Report, a census of all coins ever graded by PCGS; Certified Coin Exchange, the most respected online dealer-to-dealer trading network; and the unique PCGS Set RegistrySM, where collectors can showcase their collections and interact and compete with other serious collectors. In addition to U.S. coins, the Set Registry offers categories for coins from many countries. PCGS also attends various coin shows worldwide, traveling to more than 15 different locations throughout the year to offer our expertise and services to collectors and coin dealers. We recently signed partnership agreements with the national mints of Poland and New Zealand to establish regional coin submission centers, and look forward to establishing more such partnerships in the near future. PCGS certifies coins from over 100 countries including United States, Japan, Germany, New Zealand, Poland, Switzerland, Great Britain, France, Italy, China, Spain, Greece, Mexico, Russia, Canada, India, Hong Kong, Philippines, Australia, Singapore and African countries. PCGS standardized grading has forever changed the process of buying and selling coins, increasing confidence in buyers and sellers around the world. Ron Guth reviewing a coin.